english name "Snow Ringless Amanita"
1. Amanita nivalis, Greville's original plate (somewhat foxed), Scotland, U.K.
2. Amanita nivalis, Highlands and Islands Region, Scotland, U.K.
intro Amanita nivalis is is a small species, often white at first, but with its cap taking on grayish and pale ochraceous tints as it matures. The name was not meant to imply that the pileus is always white, but that the species occurred in areas of deep snows—such as the peaks of the hills of Scotland, from which the original collection came. cap The cap is 20 - 70 (-80) mm wide. It may be decorated with small bits of the membranous volva. Its marginal striations occupying one fifth to one third of the cap radius. gills The white to off-white to cream gills are free or very narrowly connected to the stipe, more or less crowded; and short gills are truncate or rounded truncate, but are usually few and scattered. stem The stem is 38 - 100 × 5 - 12 (-15) mm, white, and usually exannulate—although sometimes it bears an ephemeral ring. The stipe has a flaring, saccate, white to pallid ochraceous volva at its base. odor/taste The odor and taste of the species are indistinct. 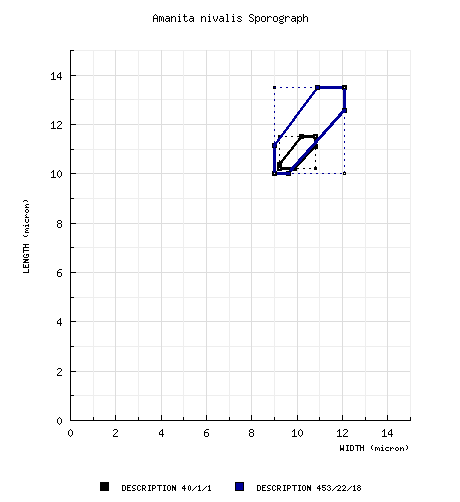 The spores measure (8.2-) 10.0 - 13.5 (-21) × (7.1-) 8.8 - 12.0 (-19.5) µm and are globose to subglobose (occasionally broadly ellipsoid, rarely ellipsoid or elongate) and inamyloid. 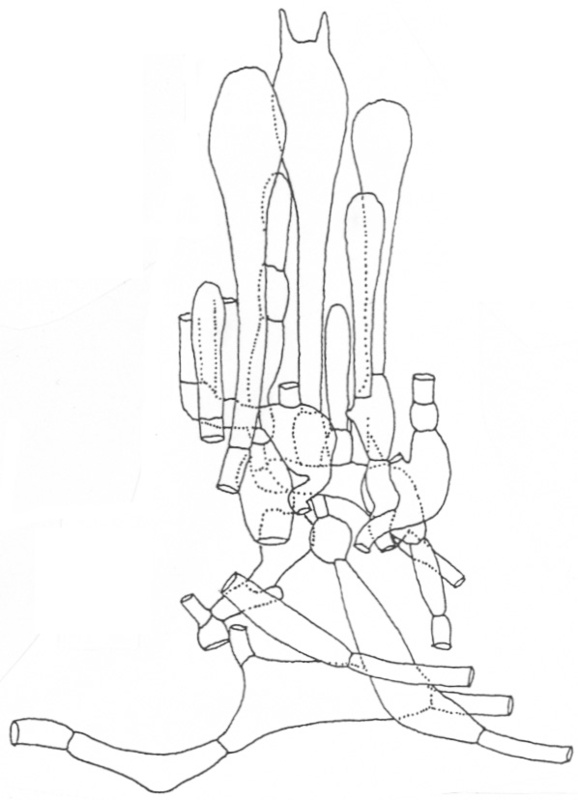 Clamps are not observed at bases of basidia. discussion Amanita nivalis is associated with dwarf willows (Salix) and is a species with alpine and subarctic ranges in Europe and Greenland. The habitats may also include dwarf birch (Betula). Recently, the species has also been reported from high elevations in the Rocky Mountains of western North America with dwarf willows. author Grev. 1822. Scot. Cryptog. Fl. 1(4): pl. 18. ≡Agaricus nivalis (Grev.) Loudon. 1829. Encycl. Plantes: 986. ≡Amanitopsis nivalis (Grev.) Sacc. 1887. Syll. Fung. 5: 22. ≡Pseudofarinaceus nivalis (Grev.) Kuntze. 1891. Rev. Gen. Plant. 2: 868. ≡Vaginata nivalis (Grev.) Kuntze. 1898. Rev. Gen. Plant. 3(2): 539. ≡Amanita vaginata var. nivalis (Grev.) Guillaud et al. ("nivea Grev.") 1884. Ann. Sci. Nat. Bordeaux 3(2): 45. ≡Amanitopis vaginata var. nivalis (Grev.) Peck. 1894. ?? 47: 169. ≡Amanitopsis alba Fayod. 1889. Ann. Sci. Nat., Ser. VII, Bot. 9: 317. ?? ≡Agaricus vaginatus var. albidus Fr. 1838. Epicr. : 11. ≡Amanita vaginata var. albida (Fr.) Gillet. 1874. Champ. (Hyménomyc.) Croiss. France: 51. 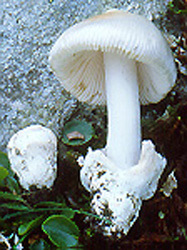 =Amanita vaginata f. oreina J. Favre 1955. Champ. Sup. Zone Alp. Parcs Nation. Suisse: 158, 205, fig. 144.
lectotypes Greville. 1822. Scot. Cryptog. Fl. 1(4): pl. 18.
lectotypifications implicit (the only existing syntype is the plate from the protolog). epitypifications Tulloss et al. 2015. Amanitaceae 1(2): 4.
selected illustrations Gulden et al. 1985. Arctic Alpine Fungi 1: 25. Moser and Jülich. 1988. Farbatlas Basidiomyc. 5: III Amanita 1. Campo and Bizio. 2000. Boll. Gruppo Micol. G. Bresadola 43(2): 177, 179, 182. The field may contain magenta text representing a type study or a study of original material by Tulloss. The following is based on the species' protolog, the neotypification, the extensive annotation of some herbarium specimens by Dr. C. Bas, and original research by R. E. Tulloss. pileus 20 - 70 (-80) mm wide, pure white as universal veil opens, sometimes becoming cream colored ("2B") occasionally with ochre (4A3-4) to pale ochre disc, soon taking on pale grayish or grayish-ochraceous tint [10YR 8/2 to 10YR 7/1-3 to 6C2 to 5B-C3 to 5B2 to 5B-C4 (at margin)], often watersoaked and then grayish, with no fibrillose structure visible (lens), convex-campanulate to obtusely conic or obtusely conico-convex then convex to plano-convex, sometimes with small obtuse umbo, smooth, often shiny, sticky or slightly greasy; context white to whitish, rather firm; margin striate to sulcate-striate (0.20 - 0.35R), sometimes splitting or becoming serrate, nonappendiculate; universal veil absent or as one or two membranous patches or as scattered (often rather large) flat warts or as many densely spaced and often confluent warts (sometimes truncate pyramidal—for more details see discussion section, below), felted-submembranous to membranous, snow white to pale sordid ochraceous (about 10YR 8/4 or slightly grayer). lamellae free to narrowly(?) adnate, sometimes with faint decurrent lines on stipe apex, subcrowded to crowded (12+ per 10 mm at midradius), white to off-white to pale cream (ca. 2B), sometimes with very pale pink or orangish white tint (5A2) at apex, becoming sordid in exsiccata, rather narrow, up to 8 mm broad and ventricose, even projecting below pileus margin in mature material, with minutely flocculose edge concolorous to very pale grayish brown to yellowish brown (in age); lamellulae truncate to rounded truncate, infrequent. stipe 38 - 100 × 5 - 12 (-15) mm, white to whitish, subcylindric or slightly narrowing upward, smooth to minutely flocculose to (very) minutely squamulose [by breaking up of "partial veil layer" (Bas 9703)], with flocculence sometimes yellowish (Knudsen & Læssøe 84.254), sometimes minutely pubescent near apex, minutely striatulate (10× lens), sometimes finely zoned-squamulose below (Borgen 78.85) or girdled (Knudsen & Læssøe 84.566); context white or whitish, stuffed to hollow, with central cylinder 2 - 9 mm wide; exannulate; universal veil as saccate volva, membranous, with exterior surface whitish to very pale ochraceous from the outset (sometimes grayish ochraceous or pinkish near margin) and rather smooth, with interior surface white to faintly pinkish buff and smooth, 16 - 25 (-40) × 10 - 23 mm, with lower third to half adnate to stipe base, somewhat flaring, divided into two or more lobes or simply cup-shaped with irregular margin, with limbus internus barely developed. odor/taste Odor indistinct or pleasant but not distinctive. Taste indistinct. pileipellis up to 115 µm thick outside of disc [up to 200 µm thick in or near disc per Bas (unpub. data)], comprising two layers of hyaline hyphae, with colorless suprapellis 5 - 30 µm ["≤ 25 µm" per Watling (1985)] thick and extensively gelatinized, with brownish yellow subpellis 30 - 85 µm [“≤ 50 µm” per Watling (1985)] thick and partially or not gelatinized; filamentous, undifferentiated hyphae 1.0 - 6.2 (-7.0) µm wide, branching, criss-crossed at surface, sometimes in fascicles; vascular hyphae 1.8 - 17.5 µm wide, common, but unevenly distributed, branching, often exposed at surface. pileus context filamentous, undifferentiated hyphae 2.8 - 11.0 µm wide, branching, plentiful, with walls slightly thickened to 0.8 µm thick, in many regions predominantly thick-walled, occasionally (usually those of smaller diameter) in fascicles, with intercalary segments swollen up to 24 µm wide, sometimes with yellowish subrefractive walls, often constricted at septa; acrophysalides plentiful, narrowly clavate to clavate to ellipsoid to subpyriform, up to 93 × 55 µm, with walls thin or (quite commonly) up to 1.0 µm thick, in many regions predominantly thick-walled; vascular hyphae 2.2 - 11.5 µm wide, apparently only present near stipe apex (and there quite common), sinuous, coiling, tangled, branching. lamella trama bilateral, with inflated cells rare or lacking in subhymenial base except near pileus context [there often taking form similar to that of swollen intercalary segments of central stratum(e.g., 27 × 17.0 µm [ovoid], 16.0 × 15.5 µm [subglobose], 30 × 16.0 µm [elongate])]; wcs = 50 - 75 (-85) µm (moderate to very good rehydration); filamentous undifferentiated hyphae 1.5 - 10.5 µm wide, branching, often with constricted septa, with some intercalary segments inflated (subfusiform) to 15.5 µm [to 18.5 µm per Watling (1985)] wide, occasionally having yellowish subrefractive walls and these sometimes tangled (sometimes densely) in central stratum or occasionally penetrating into subhymenium (e.g., in Senn-Irlet 84/127); divergent, terminal inflated cells not observed; vascular hyphae 1.8 - 5.2 µm wide, not plentiful, often absent. hymenial trama double click in markup mode to edit. subhymenium SUBHYMENIUM: wst-near = (20-) 40 - 55 µm (very good rehydration, with subhymenial tree originating within well rehydrated central stratum in cases of low wst-near); wst-far = (45-) 70 - 80 µm (very good rehydration, with subhymenial tree originating within well rehydrated central stratum in cases of low wst-far); with subhymenial tree comprising frequently branching chains of short hyphal segments, sometimes slightly inflated, sometimes branched, with scattered small inflated cells, tightly interwoven, with hyphae parallel to central stratum in subhymenial region, with basidia arising from elements of all types. basidia 38 - 82 (-90) × 13.2 - 19.0 µm, dominantly 4-, occasionally 2-sterigmate, with sterigmata up to 10.0 × 4.0 µm; clamps not observed. universal veil On pileus: as on stipe base, but with elements more collapsed-compressed. On stipe base, exterior surface: filamentous, undifferentiated hyphae 2.5 - 11.5 µm wide, branching, ungelatinized to partially gelatinized, often constricted at septa, occasionally containing small guttules, sometimes with yellowish subrefractive walls, with walls up to 0.5 µm thick, with solitary hyphae and moderately broad fascicles loosely to rather densely interwoven (criss-crossing); inflated cells very infrequent, rather small, clavate to clavate-rostrate (up to 23 µm wide), with walls up to 0.5 µm thick; vascular hyphae 3.5 - 9.2 µm wide, almost never at surface, infrequent overall, locally somewhat common, branching, ungelatinized to partially gelatinized. On stipe base, interior: filamentous, undifferentiated hyphae 2.5 - 13.0 µm wide, with intercalary swollen segments (fusiform to clavate to constricted-clavate) up to 30 µm wide, frequently branching, tangled, densely interwoven, with walls up to 1.0 µm thick, singly or in loosely connected fascicles, often constricted at septa, rather commonly containing guttules, sometimes with yellowish subrefractive walls (with such segments terminal or intercalary and solitary or in branched chains); inflated cells terminal singly, hyaline, colorless, scattered, unevenly distributed, locally in clusters, fusiform to clavate to clavate-rostrate to broadly clavate to ellipsoid to subglobose, up to 117 × 62 µm (but predominantly smaller than 75 × 45 µm), with walls predominantly thin or slightly thickened or (occasionally) up to 1.0 µm thick; vascular hyphae 2.5 - 11.8 µm wide, common to plentiful, reduced in frequency near the inner surface, commonly branching, forming knots and tangles. [Note: In "button" specimen (Senn-Irlet 13498), inflated cells not much more inflated than in mature material (e.g., subpyriform (53 × 38 µm), broadly clavate (72 × 42 µm), clavate (85 × 45 µm)); vascular hyphae apparently lacking.] On stipe base, inner surface: like interior except more collapsed and apparently completely lacking vascular hyphae and having frequent thin patches of gelatinized and longitudinally oriented filamentous, undifferentiated hyphae. 1. 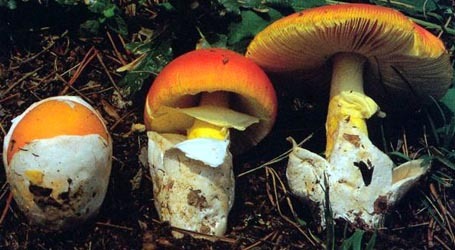 Amanita nivalis (Bas 9307), elements of hymenium, subhymenium, subhymenial base, and central stratum. 2. Amanita nivalis (Bas 9307), elements of interior layer of universal veil from stipe base. from neotype: [40/1/1] (10.0-) 10.2 - 11.5 (-13.0) × (9.0-) 9.2 - 10.8 (-11.8) µm, (L = 10.8 µm; W= 10.0 µm; Q = (1.0-) 1.03 - 1.13 (-1.16); Q = 1.08), hyaline, colorless, inamyloid, thin-walled, smooth, globose to subglobose, occasionally broadly ellipsoid, usually somewhat adaxially flattened; apiculus sublateral, cylindric to truncate-conic, rather small; contents granular to guttulate; white in deposit. composite from all material revised by RET: [453/22/18] (9.0-) 10.0 - 13.5 (-20.5) × (7.5-) 9.0 - 12.1 (-19.5) µm, (L = (10.7-) 10.8 - 12.9 (-13.0) µm; L’ = 11.6 µm; W = (9.5-) 9.8 - 11.3 (-11.5) µm; W’ = 10.4 µm; Q = (1.0-) 1.04 - 1.24 (-1.59); Q = (1.06-) 1.07 - 1.18 (-1.20); Q’ = 1.12), hyaline, colorless, thin-walled, smooth, inamyloid, globose to subglobose, occasionally broadly ellipsoid, occasionally lachrimiform or langeniform, usually somewhat subaxially flattened; apiculus sublateral, cylindric to truncate conic, rather small; contents granular to mulitguttulate to (most commonly) monoguttulate; white to creamy white [Ib in Russula spore color scale of Romagnesi (1967) for Bas 9307] in deposit. ecology Solitary to scattered to subgregarious. Finland: At 400± m elev. In alpine heath with Betula nana, Salix glauca, Vaccinium sp., Empetrum, and lichens. Greenland: on low N slope in moss, with Polygonum viviparum, Vaccinium microphyllum, and Empetrum or with B. glandulosa in dry lichenous heath or under B. pubescens or with Salix glauca and B. glandulosa. Norway: At 1230± m elev. In lichenous heath, over gneiss or with S. herbacea and B. nana or in mid-alpine belt with Salix. Sweden: At 700 m elev., in alpine zone. On hummock in swampy flat over permafrost with B. nana. Switzerland: At 1930 - 2318 m elev. In alpine turf (Nardetum alpigenum) over gneiss on a southerly exposure or on moraine in grassy heath with much S. retusa in gravely soil or in meadow with isolated Rhododendron at distance on gneiss moraine (Shinmoraine); or associated with S. retusa in grassy area with plentiful dwarf heath or on acid soil with S. herbacea and occasional Alnus viridis. Scotland, U.K.: At 730 - 1310 m elev. Associated exclusively with S. herbacea, on bare peaty soil or on Rhacomitrium heath or on mountain turf on podsolic or skeletal soils which have a pH of 4.2-5.9. In his account of the habitat and distribution of A. nivalis in Scotland, Watling (1985) states further, "It is a snow-bed agaric associated with such plants as Carex bigelowii, Galium and Polytrichum, a character from which no doubt Greville coined the epithet 'nivalis'!" material examined FINLAND: Lapland - Utsjoki, Ailigas Mtn., 31.viii.1973 C. Bas 6104 (L). ?? - Tuomikoski, 12.viii.1974 N. Tammisaari s.n. (H; L). GREENLAND: Frederikshåb, 26.viii.1978 Torbjørn Borgen 78.85 (paratype of A. arctica, C). Godhavn, 16.viii.1967 M. Lange G.67-244 (paratype of A. arctica, C). Narssarssuaq [61°10´N/45°25´W], 6-11.viii.1984 H. Knudsen & T. Læssøe 84.566 (paratype of A. arctica, C), 84.575 (paratype of A. arctica, C). Qinngua Valley, Tasserssuaq Lk. [60°16´N/44°33´W], 27.vii-1.viii.1984 H. Knudsen & T. Læssøe 254 (paratype of A. arctica, C). NORWAY: HORDALAND—Eidfjord Dist. - Stigstuv, 2.viii.1971 G. Gulden 602/71 (O as "A. vaginata var. oreina; RET 178-7). Ulvik Dist. - Finse, 14.viii.1985 B. Senn-Irlet 85/102 (BERN); Finse, "u/Jomfrunut," 2.viii.1980 G. Gulden 105/80 (O as "A. hyperborea P. Karst sensu auct.") and 106/80 (O as "A. vaginata var. oreina"; RET 178-6); Finse, Lille Finsenut, 22.viii.1984 G. Gulden 83/84 (O). MØRE OG ROMSDAL—Dalsnibba, 29.viii.1969 D. A. Reid s.n. ["lot A" of this collection was determined to be A. nivalis Grev. ; "lot B" was segregated by C. Bas, but appears conspecific on further study] (K; L). SWEDEN: NORRBOTTEN—Kiruna, Riksgrensen-Katterjaure, 13.viii.1989 B. Senn-Irlet & D. Lamoure [Senn-Irlet 89/116] (BERN). SWITZERLAND: BERN—Gadmen, Steingletscher, 16.viii.1984 B. Senn-Irlet 84/127 (BERN),1.ix.1988 B. Senn-Irlet 13480 (BERN); Oberaar, 22.viii.1985 B. Senn-Irlet 85/116 (BERN). TICINO—Bedretto, Alpe di Cruina-Corno Griess, 28.viii.1990 B. Senn-Irlet 13498 (BERN). VALAIS—Lac d’Emosson 20.viii.1992 C. Bas 9307 (L n.v.; RET 076-2, nrITs seq'd.). U.K.: SCOTLAND—Grampian Reg. - Cairnwell, 8.ix.1984 R. Watling 17489 ("epitype", E; "isoepitype", L; "isoepitype", NY 01937400; "isoepitype", RET 042-5, fragments only); Highlands & Islands Region - Tom a’ Choinich, 7.ix.1988 R. Watling s.n. [Tulloss 9-7-88-A] (RET 108-1), s.n. [Tulloss 9-7-88-B] (RET 108-5). discussion Exsiccata of this species rather frequently have "giant" and malformed spores present on the lamellae. It would be of interest to know if this characteristic provides some survival advantage for the present species. 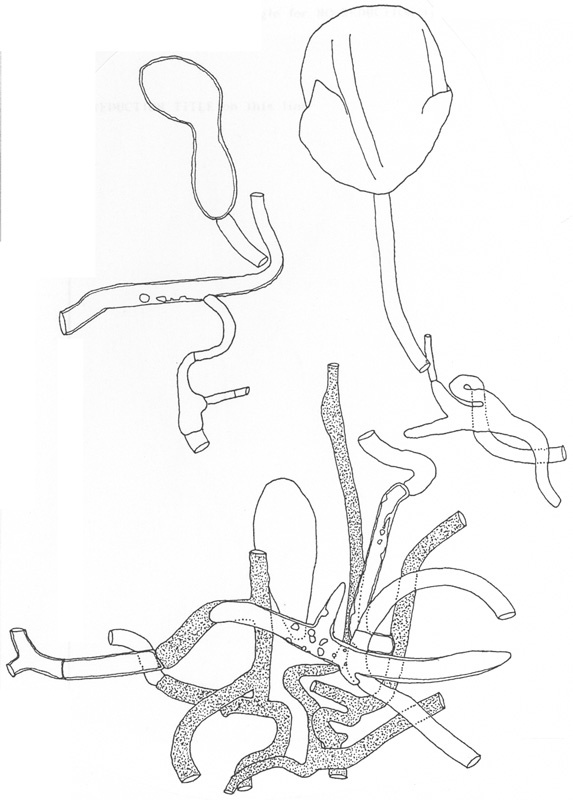 A number of collections of A. nivalis include a specimen in which the universal veil has taken the form of pileal warts and/or of a saccate volval with wart-like projections over part of its surface. The hyphae and inflated cells within such warts are often oriented perpendicularly to the pileal and volva surfaces. Dr. Bas (Leiden) gave a good deal of attention to such specimens as represented in the 1974 Tammisaari collection from Finland and the 1969 Reid collection from Norway that appear in the list of collections examined, above. I am very greatful for Dr. Bas’ generosity in sharing copies of his extensive notes on several of these collections. Gulden 83/84 is illustrated by a color photograph (Gulden: 1985: 25). 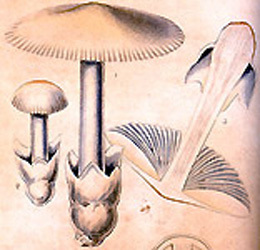 Moser 84/148 is depicted in a color plate by Moser and Jülich (1988: III Amanita 1). Bas 9307 is a composite of three collections made at localities in an area of about 500 m2. photo RET - (2) Highlands and Islands Region, Scotland, U.K.
historic plates (1) Original plate of Greville from his Cryptogams of Scotland (1821), with some foxing, from copy in library of RET. drawing RET - anatomical figs. 1-2.
provisionally identified as: Amanita nivalis Grev. select a collection to review/add spore measurements..#706289. R. Watling, #17489, U.K., SCOTLAND, Grampian Reg., Cairnwell#706290. OLIVEFONTHighlands & Islands Region, #s.n., U.K., SCOTLAND, Grampian Re..#753146. B. Senn-Irlet, #84/127, SWITZERLAND, BERN, Gadmen, Steingletscher#753147. B. Senn-Irlet, #13480, SWITZERLAND, BERN, Gadmen, Steingletscher#753148. B. Senn-Irlet, #85/116, SWITZERLAND, BERN, Oberaar#753149. B. Senn-Irlet, #13498, SWITZERLAND, TICINO, Bedretto, Alpe di Cruina-Co..#753150. C. Bas, #9307, SWITZERLAND, VALAIS, Lac d’Emosson#787295. M. Lange, #G.67-244, GREENLAND, Godhavn#787296. M. Lange, #84.575, GREENLAND, Godhavn#787297. H. Knudsen & T. Læssøe, #254, GREENLAND, Qinngua Valley, Tasserssuaq ..#791787. C. Bas, #6104, FINLAND, : Lapland, Utsjoki, Ailigas Mountain#791788. N. Tammisaari, #s.n., FINLAND, ? ?, Tuomikoski#791789. Torbjørn Borgen, #78.85, GREENLAND, Frederikshåb#791790. M. Lange, #G.67-244, GREENLAND, Godhavn#791791. M. Lange, #84.575, GREENLAND, Godhavn#791792. H. Knudsen & T. Læssøe, #254, GREENLAND, Qinngua Valley, Tasserssuaq ..#791793. G. Gulden, #602/71, NORWAY, HORDALAND, Eidfjord Dist., Stigstuv#791794. B. Senn-Irlet, #85/102, NORWAY, HORDALAND, Ulvik Dist., Finse#791795. G. Gulden, #105/80, NORWAY, HORDALAND, Ulvik Dist., Finse, "u/Jomfrunut..#791796. G. Gulden, #83/84, NORWAY, HORDALAND, Ulvik Dist., Finse, Lille Finsenu..#791797. D. A. Reid, #s.n.=>"lot A" of this collection was determined to be A..#791798. B. Senn-Irlet & D. Lamoure, #s.n.=>Senn-Irlet 89/116, SWEDEN, NORRBOTTE..#791799. B. Senn-Irlet, #84/127, SWITZERLAND, BERN, Gadmen, Steingletscher#791800. B. Senn-Irlet, #13480, SWITZERLAND, BERN, Gadmen, Steingletscher#791801. B. Senn-Irlet, #85/116, SWITZERLAND, BERN, Oberaar#791802. B. Senn-Irlet 13498 , #s.n., SWITZERLAND, TICINO, Bedretto, Alpe di Cr..#791803. C. Bas, #9307, SWITZERLAND, VALAIS, Lac d’Emosson#791804. R. Watling 17489 , #s.n., U.K., SCOTLAND, Grampian Reg., Cairnwell#791805. OLIVEFONTHighlands & Islands Region, #s.n., U.K., SCOTLAND, Grampian ..